Gold is flooding from west to east in a torrent. It is estimated that if the flow continues at the current pace Asia, principally China, will have 90 percent of all the worlds gold within 5 years. 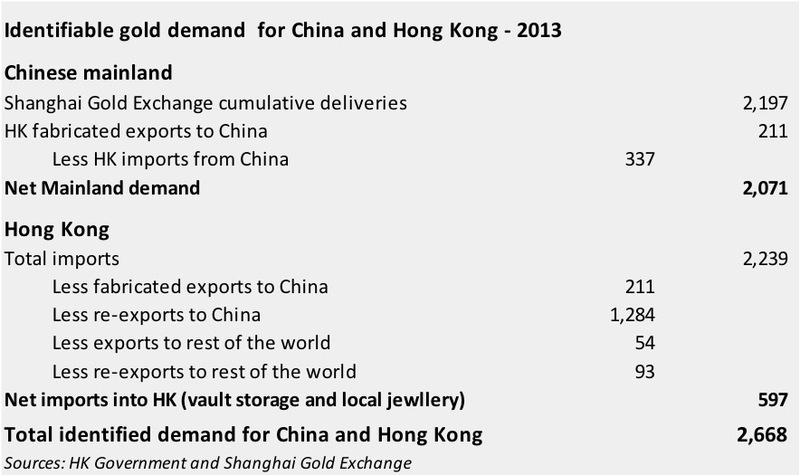 This flooding can be observed not just in the Comex gold inventory which continues to be low over the past few years, but the observation that there is now more gold being stored in Singapore that in both Zurich and Hong Kong put together. Most of this gold is in the Singapore Freeport, close to the Changi International Airport and under heavily armed guards 24/7. Gold storage in Singapore is now at an all time high. From here it flows to Hong Kong and eventually to China. The China Gold Association recently issued their report on China's gold 'consumption' for 2013 at 1,176 tonnes together with China's own production of 428 tonnes making a total of 2194 tonnes for 2013. In view of the fact that there is a lot more gold flooding into China, through the private sector, black market etc, and the accumulation of gold mines bought by China over the past couple of years around the world also feeding the great gold flood, it is a fair comment to say that the total gold flowing into China is likely to be around the 2700 to 3000 tonnes for 2013 and likely to be more this year. This might explain why the Fed has lifted the suppression on the gold price and allowed it to move up in an attempt to discourage the flow of all that gold to the east continuing. According to William Kaye, "...So my take on why we've seen this retreat by the cartel is that at these price levels demand for physical is simply too great. It strains their ability to meet these obligations if they try to keep the price below $1,300 any longer. So the bias I have at the moment is gold will continue migrating higher until some of these strains get removed"
How effective this will be is moot as the purpose of buying all that gold by China is not profit motivated, but rather a longer term policy to support the renminbi. US debt is currently sitting at 17.6 trillion as of January 2014 and most of that is owned by overseas governments and interests with China owning a good slice of that pie. In fact it is estimated that china owns 1.317 trillion in US Treasuries which amounts to over 23 percent of US overseas debt and about seven and a half percent of all US debt. Of course the amount and value of total gold accumulated by China is still minuscule by comparison. But having watched the US continue to an unlimited debt ceiling, with the consequent decrease in value of its holding, China appears more interested in supporting its own currency while reducing the devaluing debt it holds with the US. So it is quite likely that the great gold flood from the west to the east will continue even with the gentle lift in the gold price suppression. Just how high the gold price has to go before China starts to slow its imput is anyone's guess. One estimate is at around a gold price of 1400. Others estimate even higher. Since china is now importing more gold than is dug out of the ground each year and draining the western gold resources, it is fair to say that the more gold China imports, the harder it will be to get gold and the more valuable it will become. It may not be an investment with interest but it is still an excellent storage of asset value.